Quit Dreaming About Growing Your Business and Commissions … Make It Happen! Making This Your Best Year Ever! Everyone knows a storm produces the most rain, and Ed will walk you through creating the Marketing Storm you will need to set the stage for RAIN. You’ll discover how to negotiate to win! In this session Ed explains the art of winning ducks, deer and dinosaurs (small, medium and large customers). You’ll learn the action steps for achieving the more activity, more opportunities and more money. 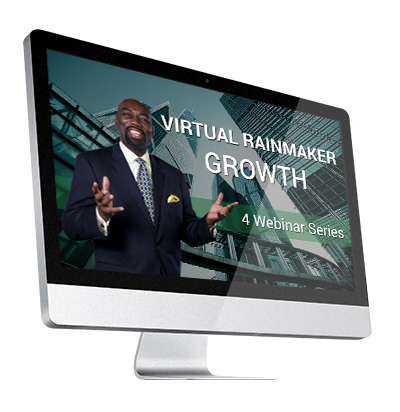 You’ll receive your own rainmaking profile as well as a one-on-one session with Ed “the Rainmaker” Robinson. Note also that you’ll have access to these four webinars for one year, to follow up and reinforce all lessons and action steps.